With Mustang production numbers dwindling each year after the 1965 model year due to competition, they made a total of 151,484 cars in 1971 with only 36,499 being fastback Mach 1s. This Mach 1 was originally a blue car and is now a candy apple red with white racing stripes. This car is the perfect driver to take out and have fun but not worry about every little pot hole or paint chip. The built 351 Cleveland small block sounds mean, has plenty of low end torque, and is an absolute blast to drive with the 4 speed. The Mustang suspension rides smooth, handles well and has been rebuilt to OE specs. The interior package is very luxurious with the black leather bucket seats, center mount gauges, and topped off with the Hurst Shifter. Overall this Mustang shows very well, drives great and is a head turner anywhere you take it! 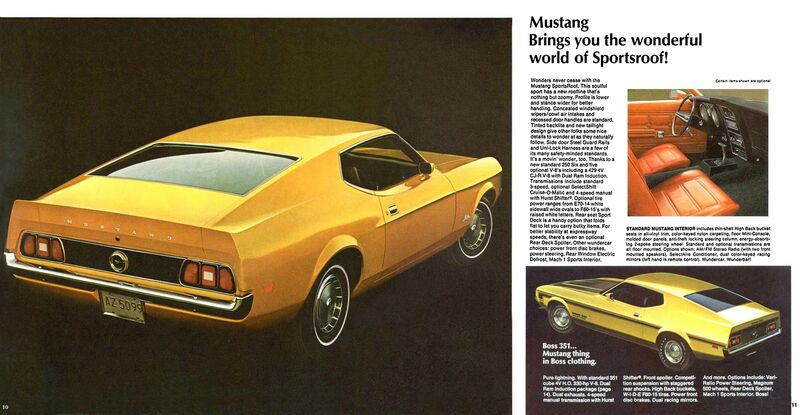 The 1971 Mustang grew wider and longer than previous years. It was two inches longer and almost two and a half inches wider than the 1970 model. The wheelbase was extended one inch to 109”. The 200ci 6-cylinder was dropped along with the 428, the Boss 302, and the Boss 429. New engines were the Boss 351, the 429 CJ, and the Ram Air 429 CJ. The Mustang Grande was basically a luxury package and one could option in any engine. It came with such comfort features as vinyl Landau roof. Offered the options of power windows and a rear window defroster. The Mach 1 encased the 302ci V8 as standard, and a new honeycomb texture grille easily distinguished the Mach 1 from other ‘Stangs, as did the Mach 1 fender and rear decals. The new Boss 351 replaced both the 302 and 429 Bosses from previous years. Boss 351 V8 was rated at 330HP. The 351 had much better low-end response, and its equal weight distribution made for better handling as well as braking.